Video Game Palooza does Exergaming events and activities! Exergaming is a new form of gaming that has been developed. The games require players to perform physical activities in order to play a game, therefore combining games and exercise. Physical activity includes anything from window washing to dancing, aerobics, martial arts, and a variety of sports moves. Kids can play a game of tennis right in their living room. In the safety of their homes kids can go virtual skiing, flying down snow covered mountains and dodging trees. Many parents are looking for ways to wean their children from video games and get them interested in pastimes that exercise more than their fingers. But not all video games are created equal. These interactive games that get kids moving are already offered at many schools and athletic facilities, as well as at video arcades. Exergames have burst onto the scene as advances in motion detection technology make increasingly sophisticated interactive video entertainment possible. Some exergames, such as jump rope without the rope, may have limited appeal. Others, such as one in which players walk inside a rotating sphere while maneuvering through a virtual reality game viewed through special goggles, require more space and money than most parents or schools can afford. Fortunately, the vast majority of exergames require nothing more than a video game console and a child willing to play them. In the past, technology has been a hindrance to exercise. Technology such as television and online gaming has prevented many kids from getting the exercise they need to stay healthy. Gaming is popular among children, and many kids spend hours in front of games without exercising. With exergaming, technology is now facilitating exercise, and it’s growing in popularity. There are different exergaming categories such as camera exergaming, rhythm exergaming, exergaming machines, workout exergaming, and sensory exergaming. Exergaming can be enjoyed by anyone, as there are games to suit people of any gender, ability, fitness level, or age. Games consist of different levels, so even beginners can enjoy the games. These games are accessible in many forms such as online, in arcades, or at home. Video Game Palooza works with the founder and creator of NBA Beat Ballers, which is one of the premiere basktetball-related exergames ever developed! We put together multi-player fun and educational camps and also work with basketball coaches on ways to increase the entertainment value of teaching basic, intermediate and advanced basketball skills while playing interactive video games. 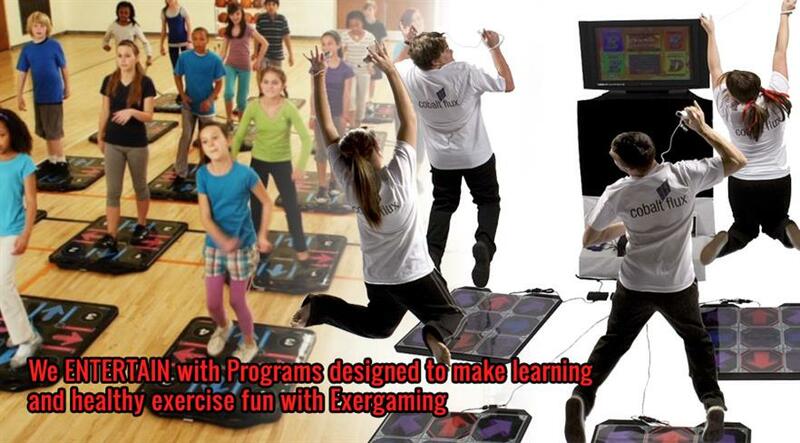 Exergaming combines kids’ enthusiasm for gaming and exercise. Games are fun and engaging, therefore encouraging children to exercise more. Exergaming promotes exercise among kids and motivates them to exercise more frequently. The physical exertion involved in the games has positive effects on health and fitness. With concerns about obesity rising, it’s important to note that exergames can assist in calorie burning and weight loss. Exergaming can help improve coordination and body movements. Another benefit of exergaming is that it helps to decrease stress levels, as it provides a way to have fun and relieve stress. Kids get an aerobic workout while playing, and exergaming has cardiovascular benefits. Exergaming promotes sensory motor learning and has positive effects on cognitive performance for children. For children who are not talented at sports, this provides a way for them to get exercise without the pressure to perform on a sports team. Kids who feel self conscious playing sports now have another alternative. It’s also an option for kids who find other forms of fitness training boring. Kids who do not often have friends around and whose parents are too busy to play sports with them can play against virtual players. Although exergaming can be played alone in the privacy of your living room, it can also be a social way to keep fit. Online exergaming communities offer a place where exergamers can meet and compete. Exergaming can be played when kids have their friends over. It can also be a family activity, facilitating family bonding, because exergaming has options for all ability levels and ages. Playing against other people promotes competition and therefore offers more of an incentive to exercise. Virtual trainers are available, so gamers can go through fitness programs where their progress is saved and reviewed. We can work with Insurance Agencies to fund exergame programs that would target children of Insurance company members. Interested in promoting the health of its members and stemming the dramatic increase in childhood obesity, insurance companies have funded studies of exergaming. One such study evaluated about 60 children, all of whom used DDR intensively for 12 weeks in their homes. At the end of the study, the children showed significant improvements in a variety of health-related factors: The children exhibited weight loss, better artery function, increased self-esteem, and better physical coordination. After seeing the positive results, Insurance agencies want to get more kids in school and parents at home involved. In addition, Insurance agencies promote the game’s use among teacher members to help them become more active. Forty-three percent of youth in central Indiana are overweight or obese, based on recent review of existing data. That means nearly a quarter million kids in our community are at significant risk of preventable health issues such as diabetes, coronary heart disease, and more. By 2025, the rate is projected to be 53 percent, unless we can stop and then reverse this trend. The community leadership behind Jump IN for Healthy Kids has committed to doing just that, and has recently set a goal of reducing that rate from 53% to 38% by 2025. 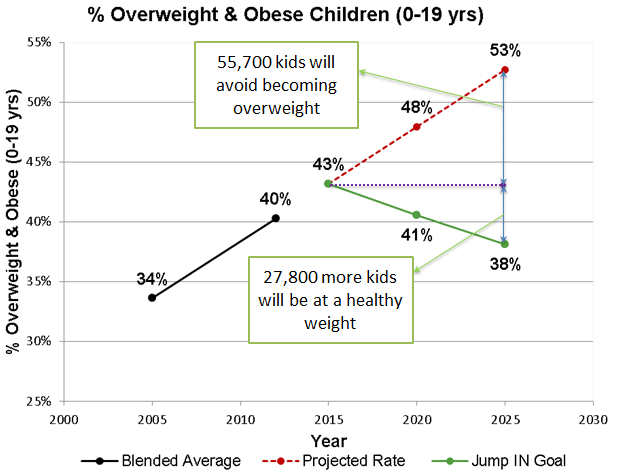 As the chart below demonstrates, the real impact of achieving this goal is not just a change in percentages but a change in health: 83,500 more kids will be at a healthy weight.